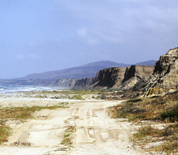 Camp Pendleton is located in Southern California bordering Oceanside on the south and San Clemente on the north. The size of Camp Pendleton is comparable in size to Rhode Island. The daytime population of the base is often over 100,000, including Marine Corps and civilian personnel. Camp Pendleton is home to 1 Marine Expeditionary Force (1 MEF), 1st Marine Division, Assault Craft Unit 5 (ACU-5), and more. This Camp Pendleton directory features the critical info you'll need to navigate through the many facilities and recreational opportunities available on base.